Over the past few years of following a pure vegetarian diet I've become that person who is always cooking, baking and mixing up thirst-quenching concoctions, and then bringing my homemade food and drinks to parties and get-togethers hoping that everyone will fall in love with the things I've made. 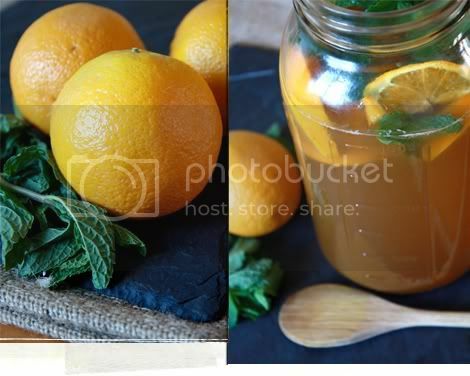 So when a friend and I decided to hang out in the park this past Sunday afternoon, I went through my online recipe bookmarks and whipped up a batch of Giada De Laurentiis’ Orange Iced Tea to bring along with me. 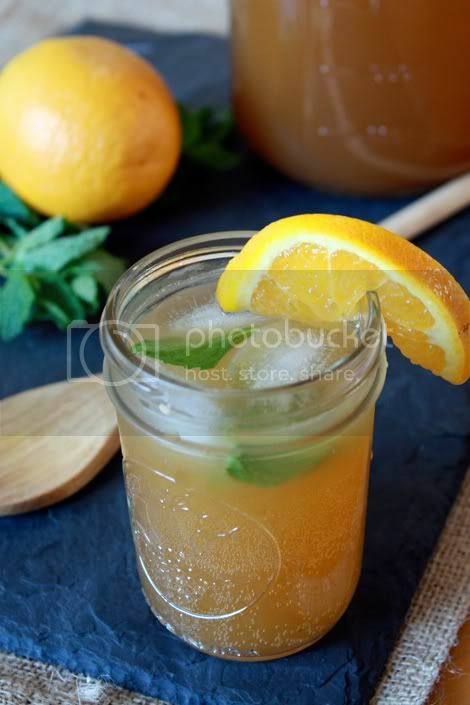 Giada’s recipe simply calls for black tea, orange simple syrup, sparkling water, oranges and mint (you can find it here), but I decided to get a little creative and added some fresh ginger and agave nectar to the simple syrup. You can stick with Giada’s original refreshing recipe, which is vegan and delicious on it's own, or give my slightly sweeter, gingered version a try — both options turn out a simple-to-make, fabulous drink to cool down with on a hot day. Prepare the simple syrup and tea: In a small saucepan, bring the orange juice, sugar, agave and ginger to a boil over medium-high heat. Simmer, stirring occasionally, until the sugar has dissolved, about 5 minutes. Turn off the heat and let sit until cooled to room temperature. Meanwhile, in another small saucepan, bring the water to a boil. Add the tea bags and remove the pan from the heat. Allow the tea to steep and cool to room temperature, about 20 minutes. Remove the tea bags and discard. Pour the tea and syrup into a 60-ounce (7 1/2 cups) pitcher and refrigerate until ready to serve. Serve the iced tea: Pour the sparkling water into the pitcher and add the orange slices. Pour the tea into 4 ice-filled glasses. Garnish with fresh mint and an orange slice, and serve.